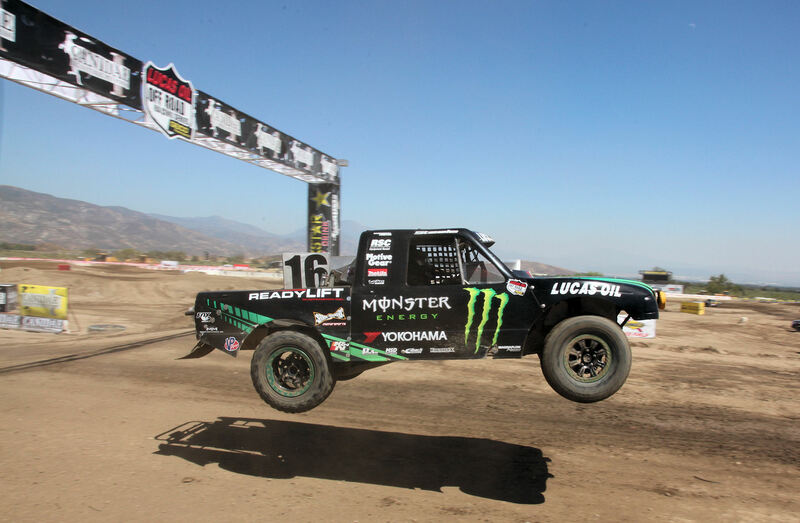 FULLERTON, CA (Aug. 9, 2011) – Yokohama Tire Corporation collected two first-place victories in the Lucas Oil Off-Road Racing Series (LOORRS) event, August 7 at Glen Helen Raceway near San Bernardino, California. Longtime Yokohama-sponsored racer Cameron Steele captured his first Lucas Oil race of the season in the Pro Lite Class, as did Chad George, who took the title in the Super Lites Class. Steele and George won on off-the-shelf Yokohama Geolandar A/T-S® tires. Steele is a veteran off-road Trophy Truck class racer who has won championships in SCORE and SNORE. The two-time SCORE Person of the Year and TV commentator said the Yokohama tires were a big factor in helping drive his #16 Stronghold 300-hp Ford Pro Lite Unlimited truck to victory. “The tires performed perfectly,” he said. The Lucas Oil Off Road Racing Series is a sixteen race series, which combines the Midwest tradition of short course off-road racing with a West Coast influence. The next LOORRS event is September 24-25, Speedworld Off-Road Park; Surprise, Arizona. Visit http://www.lucasoiloffroad.com/ for details. Yokohama Tire Corporation is the North American manufacturing and marketing arm of Tokyo, Japan-based The Yokohama Rubber Co., Ltd., a global manufacturing and sales company of premium tires since 1917. Servicing a network of more than 4,500 points of sale in the U.S., Yokohama Tire Corporation is a leader in technology and innovation. The company’s complete product line includes the dB Super E-spec™ – the world’s first tire to use orange oil to reduce petroleum – as well as tires for high-performance, light truck, passenger car, commercial truck and bus, and off-the-road mining and construction applications. For more information on Yokohama’s extensive product line, visitwww.yokohamatire.com.